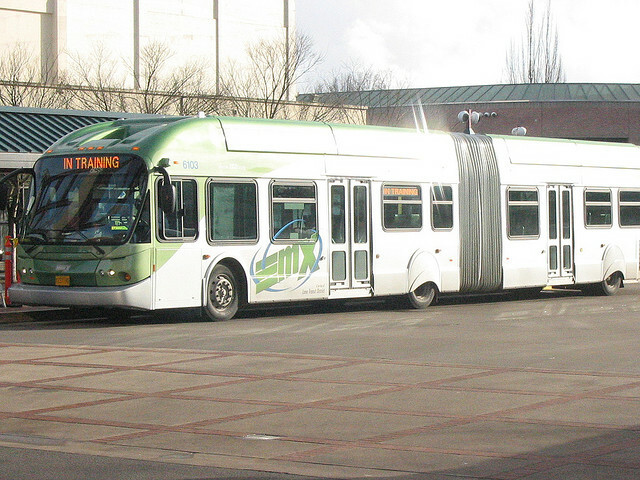 ITDP named Eugene, Ore.'s bus rapid transit as one of the top five systems at the cutting edge of bus innovation. Photo by functoruser. The Institute for Transportation and Development Policy (ITDP) released an independent study ranking the five U.S. cities on the cutting edge of bus innovation. Titled, “Recapturing Global Leadership in Bus Rapid Transit,” the study rates Los Angeles, Cleveland, Las Vegas, Eugene and Pittsburgh as the cities leading bus-based transportation, mainly due to their implementation of bus-rapid transit (BRT). Though all still in construction, the study also rates San Francisco Bay Area, Montgomery County of Maryland and Chicago as the three cities with BRT systems that have the best prospects of achieving a “gold-standard,” a certification awarded by the international non-profit Gold Standard in recognition of the system’s greenhouse gas reductions. This certification has never been awarded to a U.S. city. The study also provides a historical analysis of BRT’s in the U.S. and acts as a guideline for cities embarking on new BRT projects. The study explores service planning strategies, infrastructure requirements, design principles, service quality and information-sharing systems to aid cities who are evaluating their current systems or considering implementing new BRT’s. The study also looks at transit integration, like including bicycle lanes, and accessibility, like pedestrian cross-ways, as criteria to create a comprehensive transport system for mass transit riders. According to ITDP, today’s transit ridership in the U.S. is at a five-decade record high, with buses accounting for more than half of these trips. Yet, there is always room to improve, especially when the nationwide average bus speed is at 12.5 mph. “Passengers must often contend with limited service frequency, and with buses that don’t always run according to schedule,” ITDP explains.